Construction workers installed bright green bike lanes at three conflict points along Ludlow Avenue yesterday. The new green bike lanes are a first for Cincinnati as it continues to work towards making city streets safer for area bicyclists. According to the National Association of City Transportation Officials (NACTO), experimentations with specially colored bike lanes first took place in the mid-1990s. Then, between 1997 and 1999, the City of Portland worked with the Federal Highway Administration (FHWA) to mark 10 conflict areas with blue coloring and accompanying signage. Since that time, the FHWA has determined that green is a more appropriate color for bike lanes on public streets, so as not to be confused with accessibility parking. The City of Cincinnati used NACTO’s standard design for a truncated bike lane through an intersection as the basis for its green bike lanes on Ludlow Avenue. The installation makes Cincinnati the first Ohio city with green bike lanes. Green bike lanes have begun to appear in cities throughout North America in recent years to not only mark areas of conflict, but also delineate entire bike corridors. In the Midwest, Chicago has led the charge using green bike lanes for entire cycle track corridors, bike boxes at traffic signals, and at special conflict points. According to city officials, Cincinnati’s first application of green bike lanes will mark Ludlow Avenue where it intersects with Old Ludlow Avenue, Central Parkway and a driveway entrance to Cincinnati State (map). City planners also say that there will be additional green bike lanes to come. 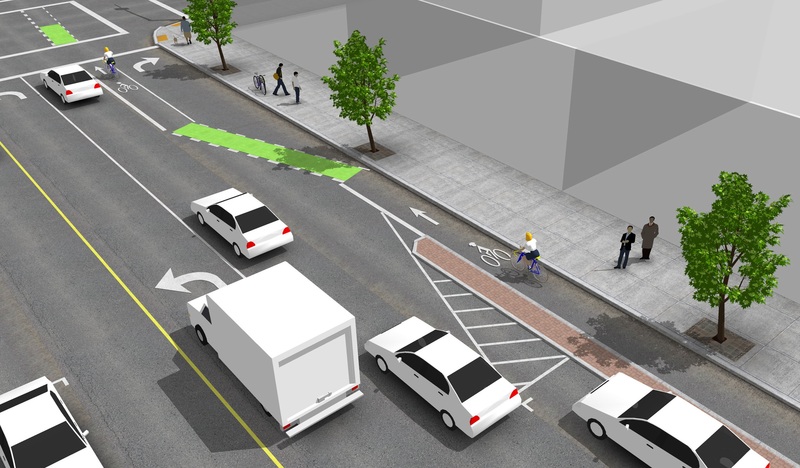 “We are considering using green markings where the Gilbert Avenue bike lane will intersect with the right-turn lane into the casino,” explained Department of Transportation & Engineering (DOTE) planner, Melissa McVay. McVay went on to say that City is using NACTO’s design guidelines and specifications for these projects, and that going forward, green bike lanes will be considered at all high conflict areas where motorists must cross a bicycle path. The idea behind the green markings is to improve the visibility of bicyclists, and in the process, improving safety. The City of Cincinnati Bicycle Transportation Program has installed 35.8 miles of bicycle facilities to-date, with an additional 289.9 miles planned in a citywide bicycle network. We sat down with Melissa McVay on Episode 8 of The UrbanCincy Podcast to discuss Cincinnati’s bike culture – where we stand, how we got here, and what needs to take place next. You can stream that podcast online for free, or subscribe to The UrbanCincy Podcast on iTunes so that you don’t miss an episode.